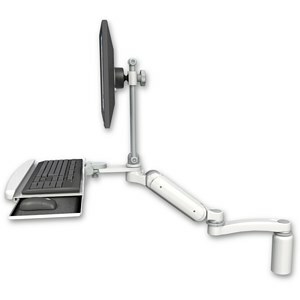 Ultra 180 Arm Desk Mount | ICWUSA.com Inc. The Ultra 180 is ideal for a desk-mounted computer. It has a slim profile that frees up your desktop to increase workspace. You can easily lift and lower your computer and adjust it for best ergonomic comfort, improving productivity and easing eye and neck strain. The monitor has full tilt, pan and rotation capability. Shown with a 5″ desk mount riser, a poly keyboard tray, and an 11″ extension arm, the Ultra 180 offers premium features in a sleek design. The Ultra arm is protected by U.S. Patent 9,243,743.